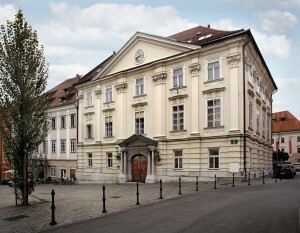 The Slovenian Academy of Sciences and Arts (by short SASA) has the oldest roots of all scientific institutions in Slovenia. Its origins can be tracked back to the seventeenth century and to the Academia Operosorum, founded in 1693. A predecessor of our Academy, the ranks of this society comprised of the most eminent Carniolan churchmen and lay intelectuals, noblemen and bourgeoise. In the second half of the nineteenth century serious efforts were made to establish the Academy, but it materialized only in 1938 as a national institution with the nomination of the first eighteen ordinary members. Today, the Slovenian Academy of Sciences and Arts is the supreme national institution of sciences and arts and associates scientists and artists, who have been elected as its members for their outstanding achievements in the field of sciences and arts. SASA cultivates, encourages and promotes sciences and arts and, through its activities, contributes to the development of scientific thought and creativity in the arts.